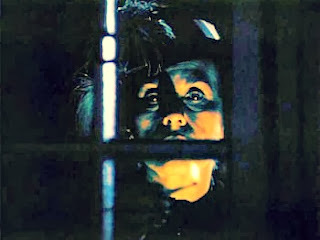 Scary shows were never my forte` although my brother occasionally made me watch them when he'd been forced to babysit me. Remember Night Gallery? There was an episode about earwigs he made me watch...I sleep with my ears covered to this day! I loved the Laura Ingalls Wilder books and series.. what a crush I had an Albert too! I used to love scarey movies of any kind, and yet they scared the bejeezus out of me and I doubt I watched any of them all the way through. I kind of remember that one but it was so long ago. They had some funny situations in that show. I remember that they tied ropes around the outhouse when their teacher was in it. The teacher was the same guy who played boss hogg on the dukes of hazard. I watched Ten Little Indians with my mom. It was really scary. Oh, yes mine was a Vincent Price wax museum movie-don't remember the name though! How about Reid? Does he think he's too much the big boy to snuggle next to Mom? I had forgotten about that, but I remember watching it as a child. Thanks for the reminder! Now the snuggling is just priceless. You are creating wonderful memories for these boys! i remember that episode. It was scary. That's good that snuggling is still required. Some day they will think they are too old for that. Has Pierce read any of the books? I do remember that episode! When I was 9, my sis took me to see the movie "Wait Until Dark." It scared me to death! Little House is a good one. I remember when are older boy was younger, he watched some old 3 Stooges and they were being chased by monsters. It took him another year or two before he would watch it again to realize that it was a comedy show. Oh how we loved the Ingalls. I remember that episode from when I was young! She subsequently got hooked on the books thanks to Santa, who'd given her the first two. Hmm, I can't remember a creepy show I loved as a kid, though I do love Alfred Hitchcock movies. As a kid, though, I remember reading "The Black Stallion's Ghost" and being sufficiently creeped out (and loving it at the same time). I never saw that one, lol!! Am LAUGHING at the whole premise of this episode! We're addicted to Dr. Who around here...creepy but not gory. I don't remember that one at all. Our Monkeys got the complete original Star Trek 3 seasons on DVD for Christmas, and are enjoying it. The scary thing about that? I STILL remember a LOT of the dialog from those ST episodes! Boris Karloff used to scare me a loot. I remember that episode! I used to love watching it growing up. how fun that you get to share it with your boys. I never watched Little House on the Prairie very much growing up but I know lots of people loved it. I don't like scary stuff, so I think I'd avoid this episode haha. Lol. That is one of the best shows. I occasionally watch re-runs. When I was little my dad used to let me stay up on Friday night and watch the old movies live Dracula, Frankenstein,and the Wolfman. Then I would go to bed and hide under a blanket with just an air hole to breath through. Little House On The Prairie was such a nice, family friendly show. They sure don't make them like that anymore. I forgot all about that one! I LOVE that your kids LOVE this show….so sweet! Moms and me watch little house on the prarie- every time its on tv..
mommy and my all time favorite. I'm not familiar with this show. i love little house! i can watch it over and over and i know the episode you are talking about! when i was little, i'd always watch The Birds whenever it came on. It creeped me out! Oh my goodness we just watched this one. The kids were laughing at it. The scary show for me was Foul Play with Goldie Hawn and Chevy Chase. My Dad played it when my mom was at work. I had trouble going to sleep for weeks. My mom was so mad at him for letting me watch it. To make matters worse he went under my bed one night, and jumped out at me. He has a twisted humor.